I can’t believe that Christmas is a week and for any of you thinking what to get Baby for their First Christmas we just love the Tiny Love Toys. Follow Me Fred, which also comes in pink called Follow Me Fiona is a baby-activated electronic dog encourages baby to crawl by barking and playing a friendly tune. It has a flexible middle allows Fred to turn in circles. This is great for baby;s who can’t crawl yet and also for those crawlers. It’s great for ages 6-12 months! Jumpy is a huge hit with Shelby and her cousin. From ages 3-6 months baby can hold Jumpy in one hand or with both hands and bring it to his mouth to explore the textured balls or rub the rattling hands with the little bumps. Then from 6+ months baby can move it from one hand to another, shake it and watch how it moves. Baby can also put Jumpy on the floor and strike the head to see how the force causes it to move and bounce. As you can see from all the toys, they are all bright fun colors! They are great for boys and girls and of all ages! Each is easy to clean as well! You can purchase online at Tiny Love. I love Tiny Love toys! 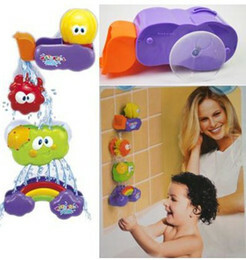 They are so cute, bright colors, and keep little ones entertained!